Title page inscribed by the author to illustrator "Daniel Maclise From his friend Charles Dickens, Eighteenth October 1842," one day prior to its official publication. American Notes for General Circulation is a travelogue by Charles Dickens detailing his trip to North America from January to June, 1842. Whilst there he acted as a critical observer of North American society, almost as if returning a status report on their progress. This can be compared to the style of his Pictures from Italy written four years later, where he wrote far more like a tourist. His American journey was also an inspiration for his novel Martin Chuzzlewit. Having arrived in Boston, he visited Lowell, New York, and Philadelphia, and travelled as far south as Richmond, as far west as St. Louis and as far north as Quebec. The American city he liked best was Boston – "the air was so clear, the houses were so bright and gay. [...] The city is a beautiful one, and cannot fail, I should imagine, to impress all strangers very favourably." Further, it was close to the Perkins Institution and Massachusetts Asylum for the Blind where Dickens encountered Laura Bridgman, who impressed him greatly. I can do nothing that I want to do, go nowhere where I want to go, and see nothing that I want to see. If I turn into the street, I am followed by a multitude. ...he looked somewhat worn and anxious, and well he might; being at war with everybody – but the expression of his face was mild and pleasant, and his manner was remarkably unaffected, gentlemanly, and agreeable. I thought that in his whole carriage and demeanour, he became his station singularly well. Although generally impressed by what he found, he could not forgive the continued existence of slavery in the United States, and the final chapters of the book are devoted to a criticism of the practice. He was also unhappy about copyright issues. Dickens, by this time, had become an international celebrity, but owing to the lack of an international copyright law, bootleg copies of his works were freely available in North America and he could not abide losing money. Dickens called for international copyright law in many of his speeches in America, and his persistence in discussing the subject led some critics to accuse him of having traveled to America primarily to agitate for that cause. Dickens' letters home to his friends, including John Forster and illustrator Daniel Maclise, helped to form the basis of the book. Throughout the narrative, finding much to admire in Americans he met and in their way of life, he also notes what he sees as their faults, sometimes jocularly. Then, in a conclusion, he gives his considered analysis of what he views as major flaws in US society. First and most serious is slavery. Apart from its corruption of both whites and blacks in slave states, the free states are complicit in the system. In particular, he is horrified by the physical violence vented on both male and female slaves. Next, he places violence. The ideals of liberty and equality seem to include the freedom to shoot or knife any other American. Third, he cites what he calls universal distrust, the extreme individualism that leads people to suspect others and to seek advantage over them. With a few exceptions, the scandal-seeking press contributes by undermining private life and destroying confidence in public life. Allied to this is the overriding commercialism, with the urge to pull off a smart deal and the idolisation of successful businessmen. In this capitalist jungle, he finds most people far too serious and puritanical, lacking humour and a wider perspective. Finally, in too many places he finds standards of personal cleanliness and public health still very primitive and is particularly disgusted by the almost universal habit of spitting. 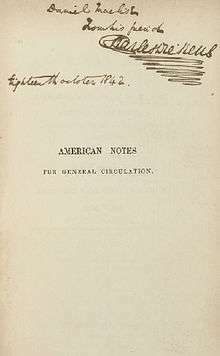 According to Dickens' biographer Michael Slater, the title American Notes for General Circulation may have been a joke at the expense of American currency. The end of the Second Bank of the United States and the ensuing Panic of 1837 led to widespread bank failures and rendered much paper currency worthless. The book formed the basis for Dickens in America (2005), an authored documentary series by Miriam Margolyes in which she followed Dickens' journey through the United States, visiting many of the places mentioned by the author in his book. ↑ Hudon, Edward G. "Literary Piracy, Charles Dickens and the American Copyright Law." American Bar Association Journal, Vol.50, No.12 (December, 1964) p. 1159. ↑ Slater, Michael (2009). Charles Dickens. Yale University Press. p. 201. ISBN 0-300-11207-6.